SCARP Alumnus Ren Thomas has written a new book that includes a range of practice and research based cases in eight areas: community and social planning, urban form and public health, natural resource management, housing, participatory processes, urban design, urban redevelopment, and transportation and infrastructure planning. They include examples from urban, rural, and Aboriginal communities across the country. 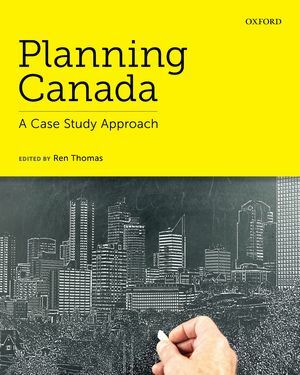 Planning Canada: A Case Study Approach is intended to introduce undergraduate students in planning, geography, and urban studies to the planning discipline in Canada, but the case studies offer enough depth to be used in graduate courses as well. Dr. Thomas received her PhD from SCARP in 2011, she is a researcher and writer and Principal of Ren Thomas Urban Research & Consulting. Dr. Thomas is currently a visiting professor at the University of Oregon. "It is high time for a new Canadian urban planning text.... This book is well thought out in terms of engaging undergraduate students." Written by a combination of academics and professionals, this is the first text of its kind to merge the two worlds for an undergraduate audience. Abundant case studies explore a variety of inspiring research studies and planning projects that have been carried out across Canada, providing insight into innovative approaches, plans, and solutions developed by Canadian planners. Practical approach introduces students to planning as a profession, and highlights key projects and the types of opportunities that are available in the field. In-depth treatment of key issues affecting Canadian cities and regions—including urban sprawl, immigration and diversity, Aboriginal rights, vulnerability and risk assessment, and climate change—helps students become aware of the vast range of social and geographic challenges shaping planning decisions in Canada today. To consider Planning Canada: A Case Study Approach, or another great OUP title for your upcoming courses, please contact your local Oxford University Press Sales Representative or email sales.hed.ca@oup.com. estimated enrolment, current book in use, and the course start date.